Update 12/8/09: I’m excited to be a featured blogger on Oprah.com for Oprah.com’s Holiday 2009 blow-out ~ come see our favorite holiday recipes! Okay, so way back at the beginning of November I told you about Enstrom’s Chocolate Almond Toffee and made the bold assertion that my mom (Fuji Nana) makes the best chocolate almond toffee in the universe. Since making that assertion I’ve received enough emails from some of you that I have edited my production schedule, as it seems you want me to back up that assertion now, rather than later. So, as my little gift of thanks to you for putting up with me, I’m going to share Fuji Nana’s amazing toffee recipe with you. I made a batch yesterday, wanna see how I did it? First, I arranged some almonds on my beloved Silpat, trying not to let too many jump into my mouth. until it was the color of the almonds I had set out. Then I quickly poured the mixture over the almonds, but I didn’t scrape the pan (you don’t want to get any crystals from the sides of the pan to go into your toffee, it ruins the texture). But, because I was distracted because Squirrel kept trying to stick her wooden spoon in the pot at the same time, things got a bit uneven, and a bit thinner than I would have liked. But, instead of making a new batch so that you could see super pretty toffee, I decided to show you real life instead, and today real life is only semi-pretty, but still super yummy, toffee. Gotta problem with that? Then I left everything to cool so that it could get nice and hard an glossy. and then spread that chocolaty goodness right over the top of the toffee. Then I took some ground walnuts (I like to use 1/2 cup) and spread them all over the top of the chocolate, and let all of that sit for a while to let the chocolate set up. Finally, the toffee was ready to be broken into pretty bits to show you! Of course, a few teeny tiny bits may have made it into my mouth in the process . . . .
Luckily I’m preparing for the arrival of my in-laws who are coming for a Thanksgiving visit, otherwise we may have arrived at there only being one piece left all-too quickly. But because I need to have some to share with them, I’m practicing massive amounts of self-restraint. Although I guess all I would have to do is make another batch . . . .
1. 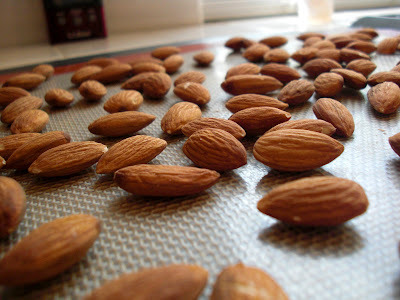 Arrange the almonds in a single layer on a foil-lined baking sheet (or on a Silpat set on a baking sheet) over an area measuring 12×7 inches; set aside. 2. 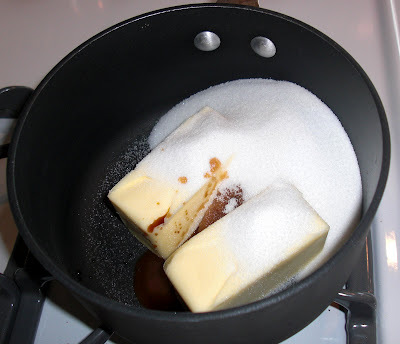 Combine butter, sugar, vanilla, and salt in a heavy 2-quart saucepan. 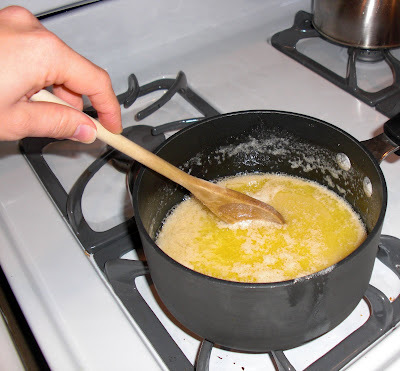 Cook over high heat, stirring constantly with a clean, dry, wooden spoon until butter is melted. 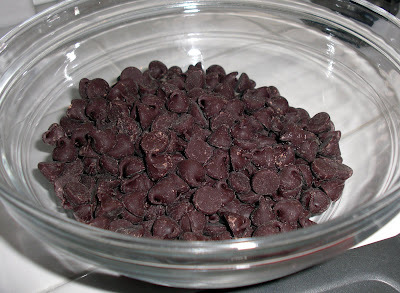 Continue cooking and stirring for 5 to 7 minutes or until candy is color of unblanched almonds. 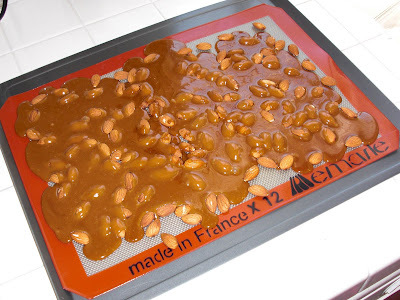 Immediately pour candy, without scraping pan, over almonds, covering all nuts. Cool completely. 3. Meanwhile, melt chocolate in a heavy saucepan over low heat or in the microwave oven for 1 to 2 minutes or until chocolate is soft enough to stir smooth. Make sure to stir often so it does not burn. 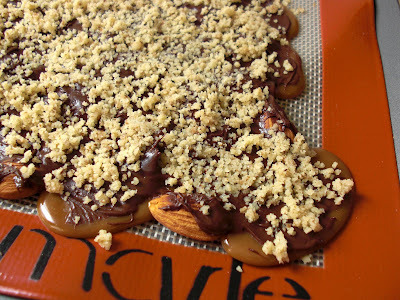 Spread chocolate mixture over cooled toffee and sprinkled with walnuts. Let cool until chocolate has hardened, then break into serving-size pieces. excuse me, but now i HAVE to make one more thing this week. this looks just sickly good. i might even be a bit naughty and top it with salted pistachios since bazzini’s is down the street from me. oh, fuji mama, you’re so bad, you’re good. yum yum! happy thanksgiving! OMG I LOVE TOFFEE! Thank you for this recipe! And thank you for the visit to my blog! GREAT blog, I will be back often. 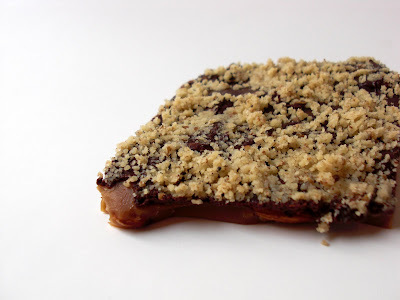 Almonds, chocolate, and toffee…yum! No wonder these are acclaimed. Thanks for sharing the recipe and the lovely photos. Toffee rules! This is going in the recipe list, next time I need to reward my girlfriend (or myself, heh) I’m totally making it. I just made this… incredible!! 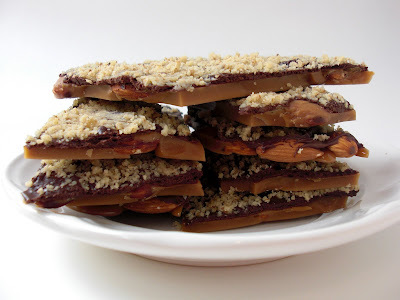 My Nut Butter Crunch is close to this recipe, except for pecans instead of almonds. Pecan halves on the bottom, crushed pecans on the top. Wonderful! This looks delightful and delicious. Thank you so much. I couldn’t find anthing this simple on the www. And if I go to all the trouble of making it, I will be excused for eating it too. those photos are taunting me! this stuff looks absolutely amazing, i think it would make a great little holiday treat to gift to my friends :) how long do you think this would keep? Can you have a big piece for me? I printed out the recipe and am giving this a try ASAP! Thanks for sharing the recipe! What a great holiday gift idea! And your photos are great. The combination of all those ingredients make the mouth water. Thank goodness you have two sticks of butter in this recipe.. that helps tremendously.. I can just glue as stick to each thigh. I had being uneven about things you know. Also that’s a LOT of stirring. I thought it would never change colour, but it did, eventually. Oh the other reason not to use stainless steel pot is that when it changes colour it burns the sides of the pot. (and i can’t get that off either). Yasu and i loved it. We couldn’t leave it alone, amazing how much there is when you break it into pieces. I would appreciate a reply if you have the time to make one, regarding my silpat question. Is there another word for it? I can’t find it in australia. I used baking paper and it didn’t stick, i peeled it off the back, but i would like to get one of the things you call a silpat. OK. We just had to try this after seeing your post (and those pictures!). They turned out AMAZING, and will be part of dessert for our delayed celebration of Thanksgiving in Japan this Sunday. (And yes – (1) Silpats are the best; (2) We are loving the kaki and mikan in Japan this time of year. Just wondering if you ever reply to your comments. Thanks guys! I’m glad so many people have tried it and loved it as much as my family. It’s good to know I’m not the only one consuming extra calories! Kelly– Sorry if you’re frustated by my slow reply time, but I’ve got a house full of houseguests due to the holiday here in the US and I’m also extremely pregnant (everything is taking me WAY longer these days!). This is the first chance I’ve had to sit down and write a reply. To answer your question, a silpat is a reusable silicone baking mat. I provided a link within the post to one place to buy it here in the US (amazon.com). I would try checking out any baking supply source that you have access to. The recipe also explains that you can use a foil-lined baking sheet I’ve never tried using baking paper). I’m glad you enjoyed the toffee! 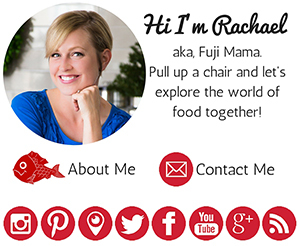 You can also always email me (my email is provided on the left sidebar) with any questions. Megan– The toffee will definitely keep a week, but after that I’m not sure because it never lasts very long in my house! The first thing to go will be the chocolate as it will begin to look a bit spotty. Sorry I don’t have a better answer for you! Fuji Mama, i realised that after i posted and re-read some entries!! Sorry about that… :) I forgot it’s thanksgiving…we don’t have it in oz, so i didn’t realise. My apologies. And i know what you mean about it not lasting long! Mine has gone already thanks to hubby scoffing it down. I’m thinking of making some and putting them in celophane and giving them to a few neighbours over christmas. I love how the toffee is not too hard, it’s great for my mum also who has false teeth. That looks delicious…. love love love homemade toffee! A couple of tips — the toffee recipe I use says to stop stirring after the butter is melted and everything is combined, and it seems to work fine; if you have a candy thermometer, go for 285 degrees; and if you don’t have a Silpat, nonstick aluminum foil (like “Release” foil) works well too. Yum! 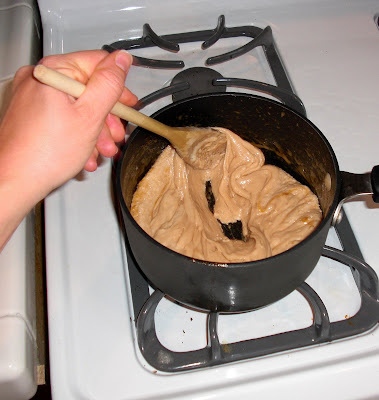 Anonymous– Yes, I’ve seen toffee recipes like that too. I find with this particular recipe that you get a more even color if you keep stirring. Also, my recipe does specify that foil-wrapped baking sheet can also be used (I just happened to use my Silpat this time around)! 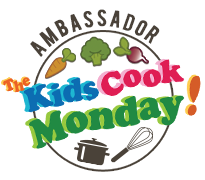 I just gained 5 pounds by reading your recipe and looking at the yummy photos! 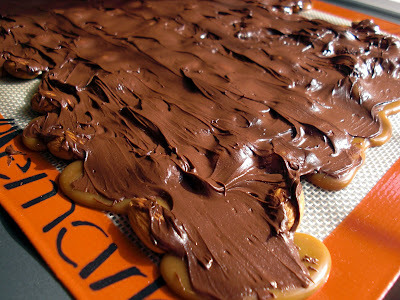 I have everything ready to make toffee, but I am scared….nervous….read somewhere to make it on a dry (not humid) day. Any advice? I made these yesterday. They were SOOOOO good. This recipe is so easy and a definite keeper. Thank you! I am making some more batches and giving them away as xmas gifts. Frieda– My advice? Just dive in! Seriously I’ve made this recipe a million times and the only problems I’ve ever had were caused by me not paying attention and letting the toffee get to dark before pulling it off of the heat! I love this recipe because you truly don’t need to use a candy thermometer to get perfect results (unlike lots of other candy recipes I make). Just give yourself a bit of uninterrupted time and go for it. The hardest part is making the toffee, the rest (putting the chocolate and nuts on) is a piece of cake! This looks like an amazing recipe, it’s similar to another one I have, except with crackers instead of almonds. I’m definitely gonna try this! OH DEAR GOD!!! 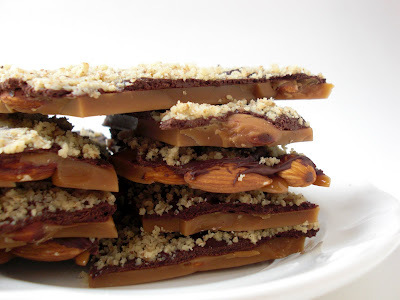 I just made this toffee and it is soooo good. I couldn’t wait for the chocolate to finish hardening. I had to eat it still warm. It was great. Thanks you soooo much!! Naughty. Just looking at these photos makes me feel the need to go run a few laps around the house. I’ll try this recipe the next time company comes over so I don’t dispose of it all by myself! That’s I am looking for, thanks so much, saved it!!! Oh, oh…two things I love. Homemade toffee and Enstrom's. Enstrom's is a Denver institution; used to be one store in Cherry Creek area and it was a dedicated trip to get there and buy packages for the holidays. Then I tried making my own several years ago and have found it easy and just as good. I love this recipe since I have whole almonds and none that are blanched so will be trying this today! I had a friend here yesterday to spend the day baking with me and she was making toffee. She insisted in relying on a candy thermometer she had brought with her. First batch was too dark, 2nd one totally burned that she pitched, so with the third try, I tried to get her to adjust based on color but no, pretty much ruined that, too. Even her son who she thought would eat anything sweet noticed a weird taste (burned will do that). 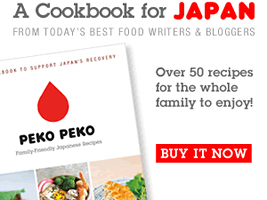 Listen to Fuji Mama, the color is key…warm golden brown, get it out of the pan! All I can say is that initially I used another recipe that was of good looks and poor taste. I had to contain myself from eating this wonderful fat calorie recipe.but so what you only live once! The butter really makes a difference! And the looks won't prevent you from trying that first piece that gets you hooked. I thank you so much for providing the pictures to assist along with the process. I tried making the recipe but couldn’t get past burned butter. The butter never turned gooey – it just went straight to burned in about 5 minutes and the butter separated. Any idea what I did wrong? I used a stainless steel pot (didn’t have a heavier pot) over high heat stirred constantly. 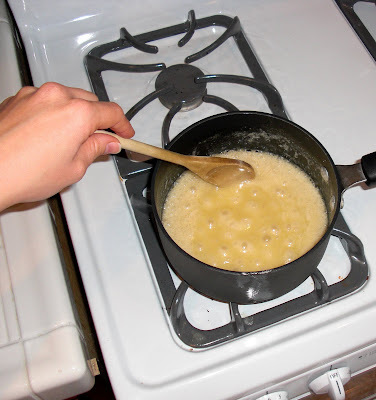 Julie– When you say your butter never turned gooey, are you referring to the butter/sugar/vanilla salt mixture? If that mixture is going straight to burned, then your pot isn’t heavy enough and your mixture is cooking too quickly. 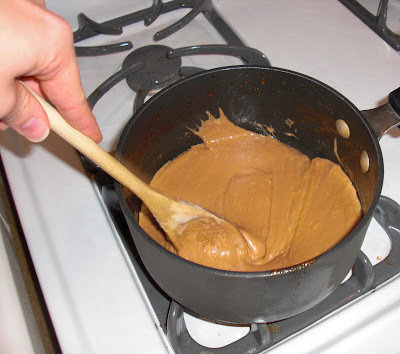 The mixture should slowly start to thicken and then change color. You have to watch carefully at the end because the color change will happen quite rapidly. You might try cooking your mixture over medium heat. This recipe looks so wonderful, I can’t wait to try it! I was sent here by @VinoLuci on Twitter. @Chef_Jay posted on Twitter that tomorrow is National Toffee Day and when I asked for a great toffee recipe, @VinoLuci gave your link. I’m so glad she did : ). As per Josie’s (DayDreamerDesserts) recommendation…I came running to get this recipe. Mom will forgive me for anything after I make her a batch of these. Fantastic ingredient blend. And thanks for all the great instruction. I don’t own a silpat, so is there a different thing I can use? Could I just use a cookie tray or aluminum foil or..? No idea how I found this, but making some right now for a new mama. I think it’s easy to say, she’s gonna love it. Thank you for sharing your Mommas awesomeness. Peanut Butter Fingers » Hello Fresno!